Joseph Mason Anderson was born in Mesa Arizona on 26 February 1929 and passed away on 23 August 2014, at the age of 85, in the Mesa home he built. Dad lived an amazing life. In his youth he was a cowboy, lumberjack, quarryman, fought forest fires, and served in the Arizona National Guard. Later in life Dad was a Master Plumber. He then turned his horticulture hobby into his business as a nurseryman, landscaper, consultant and lecturer. Dad exemplified service. For 20 years he served as an advisor to the Mesa Public Schools Agriculture Department, seven of those as Chairman. He also served five missions for the Church of Jesus Christ of Latter-day Saints, including Adam-ondi-Ahman. Joe is the son of Joseph Smith Anderson and Mettie Josephine Brewer and the stepson of Edwin Hamblin Lee. He is survived by his sweetheart of 64 years Arlene Judkins Anderson, daughters Wendy Thompson (Mark), Jolene Jackson (Leon), Daryrene Cannon (Craig), sons Kevin (Cherri) and Darwin (Cindy), 25 grandchildren and 60 going on 61 great-grandchildren. 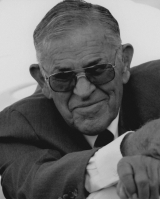 Services will be Saturday, 30 August 2014 at 10 AM, preceded by a visitation at 9 AM, at the LDS Church at 933 E. Brown Rd. on the corner of Miller and Brown in Mesa. Arrangements by Bunker’s Garden Chapel. We first met Joe 40 years ago when we moved into the old 28th ward. He was a hard worker and the thing that we liked the most about Joe was that he was the “real deal”- even if you didn’t agree with him, you always knew where you stood with him. He also had a great love for Arlene and his kids and grandkids and was so proud of them. You all are in our thoughts and prayers. I’m am so sorry to hear of Brotger Andersons passing. He was a great father to my best friend Jolene Jackson and leader in the church. I have Loved his family since 1978. Peace be unto this sweet family.